In my last post, we rolled into Santa Fe, checked out the historic downtown and got dinner before settling down for the night. We got an amazing night’s sleep on our first night at the Hotel Chimayo, and headed out into a cold Santa Fe to find some breakfast and start the day’s sightseeing. We wandered around for a little while, checking out our options, before deciding on the Plaza Café. It was super-convenient, because as the name implies, it was right off the main square. It has been in business since 1905, and has been owned by the same family since 1947! At the Plaza Café, Jon enjoyed the egg white omelet with a side of fruit, and I had the huevos rancheros (it seems to be a theme with us – he orders the more healthful meal, and I pig out. He eats more snacks – so it must even out!). The service was fast and friendly, and our server seemed to know many of the customers that came in. That says a lot about a restaurant. We got on our way after breakfast, and our first stop was the Loretto Chapel. 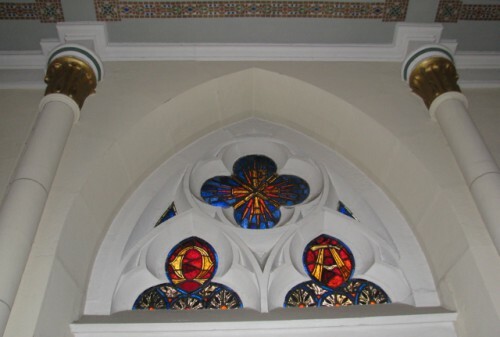 The Loretto Chapel was built by the Santa Fe Archdiocese as a convent chapel. Construction began in 1872. The architect died suddenly during construction, and it was discovered that due to the narrow design of the church, the choir loft could only be served by a ladder. The nuns weren’t comfortable with having to climb the ladder up to the choice loft in the long habits they wore, so they prayed for someone who could design and build a staircase that would fit into the space. As the legend goes, on their ninth day of prayer a mysterious man showed up and announced that he was the man for the job, but that he needed total privacy during construction. He locked himself into the church and wouldn’t allow anyone to watch him work. Three months later, he finished the staircase, would not accept payment and disappeared as mysteriously as he had arrived. Further inspection showed that the staircase is made from non-native wood, and is completely free flying – it is not connected to any of the walls. The theory is that the staircase is narrow enough for the center pillar to provide enough support. The staircase is also made without nails; instead it is completely constructed with wooden dowels. It does two complete spiral rotations. The nuns believed that the staircase was a gift from God. 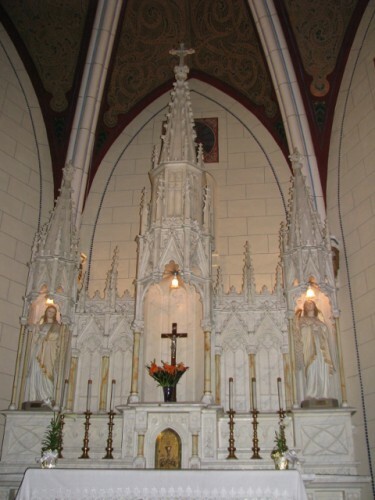 Although the Loretto Chapel was once a Catholic chapel, it has since been deconsecrated and sold to a private museum, which runs it as a tourist attraction and wedding chapel. The setting is a little cheesy, as there is an audio loop playing some corny religious music and a voice over explaining the story of the miraculous staircase. That said, admission was only $3 per person, and it was neat to see the staircase. When we were there, it was fairly quiet inside, so I could get some photos without people in them. However, shortly after we arrived, a large group of tourists arrived, so we made a hasty exit through the gigantic gift shop and back out to the street. You should know that after construction, the staircase was attached to a support beam to help stabilize it, and the railings were added about 10 years after the original construction. So, it isn’t completely original. And in case you are absolutely enthralled with the story, there is a TV movie called The Staircase starring Barbara Hershey, that roughly depicts the story. I haven’t seen the movie, so if you have, be sure to let me know how it is, but don’t tell me how it ends… Ha! 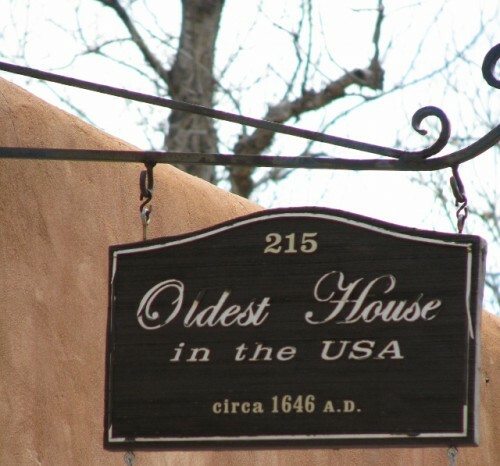 After the Loretto Chapel, we made our way over to the “Oldest House in the United States.” The “house” is now a real estate office, but the sign outside indicates that it was built in approximately 1646. 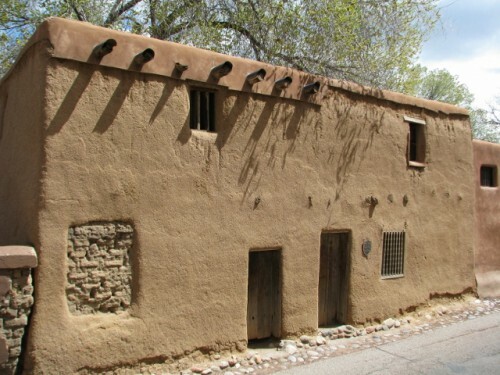 A quick search of the internet however, reveals that if this house was built in 1646, it is nowhere near the oldest house in the U.S. That distinction belongs to the cliff dwellings of the Puebloan people (now abandoned) or the homes of the Taos Pueblo (which are still occupied); they were built between 1,000 and 1,450 C.E. Or the several homes on the East Coast that are older. 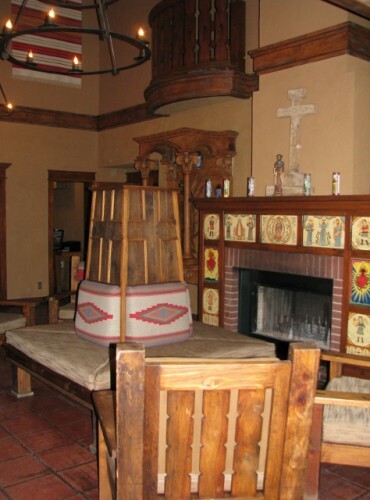 Have you ever been to Loretto Chapel or the “Oldest House in the U.S.”? What did you think? After the C&C, we made our way to downtown Santa Fe, where we would be staying the next two nights. To be honest, I was pretty excited about having two nights in one place! 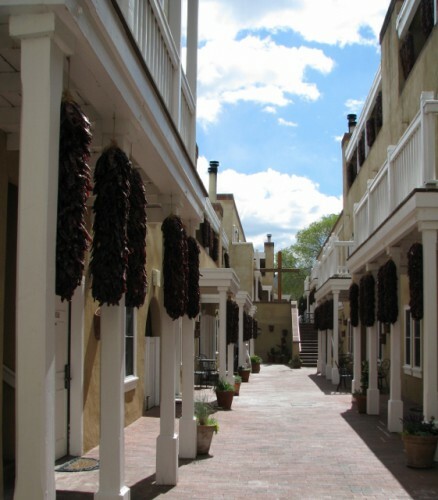 Our home away from home was Hotel Chimayo de Santa Fe, a locally owned hotel right in the heart of downtown, just around the corner from the main square and the Palace of the Governor’s. Awesome location! 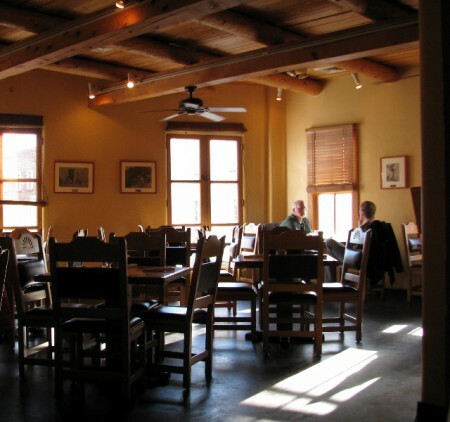 And a percentage of the proceeds from your stay go to the Chimayo Cultural Preservation Association (CCPA), a group dedicated to historical preservation of the nearby community of Chimayo. We got checked in just before 5 and were delighted with our room, just off a courtyard with bistro tables and hanging ristras (strings of drying peppers). Our room was very spacious, with a living room and a bedroom. The only drawback was that the bathroom was tiny, but the vanity was outside in a little alcove off the bedroom anyway, and how much time do you really spend in the bathroom? We set our bags down, relaxed for a few minutes, and then set out to see some of the city before the light faded into evening. The downtown historic area of Santa Fe is quite compact, and easily walkable, so we checked out some of the places that we wanted to visit in the next two days. I just kept getting more and more excited as we wandered around and peeked in closed shop windows, and saw the historic Pueblo style abode buildings. This was Santa Fe! Jon was excited about our dinner; he had picked out the Blue Corn Cafe for our meal that evening. A friend of his back home had told him that it was really good, so we checked it out. I was surprised to see it so empty when we arrived, but that became a theme for our whole visit to Santa Fe – apparently late April is still the off season, because it can be so cold (and it was, but we didn’t let that stop us). The Blue Corn also brews its own beer, so of course we had to try it. Jon had the Southwest Cobb Salad, with a Roadrunner IPA. The IPA has a medium body and a long, bitter finish. It contains 8 hops varieties. He also enjoyed their Gold Medal Oatmeal Stout, made with rolled oats and possessing chocolate and coffee flavors. Yum! I had the Atalaya Amber, which is described as a well balanced beer with a hint of citrus, brewed with Cascade and Mt. Hood hops. Hops from home! I guess I shouldn’t be surprised, because Washington state produces over 77% of the United States’ hop crop (say that 3 times fast!). I paired my beer with the Steak Fajitas. I liked the fajitas, but I was a teensy bit disappointed. You see, they were served with green and red peppers and onions, but I don’t like onions. Normally I just ask if they can substitute the onions for something else. Mushrooms, carrots, cabbage… I’m not picky. But apparently the Blue Corn didn’t have anything else they could throw in. Really? That seemed surprising. I ended up getting more peppers. But still, we were both pleased with our meals and our beer, and we left full and happy. And I forgot to take a picture before we both devoured our meals. We walked back to the hotel for a nightcap at the very empty (low season again) hotel bar – an Amaretto Sour for me and a Gin and Tonic for Jon, before heading back to our room to watch TV. What a great day! 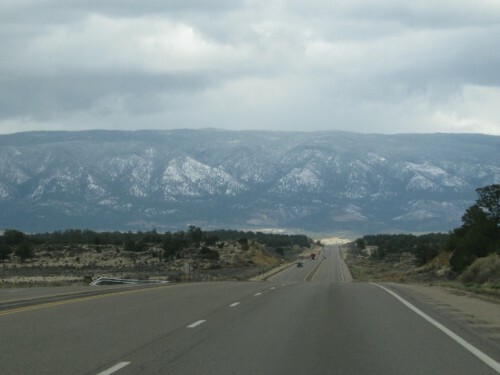 A view of the mountains on the way to Santa Fe – maybe the Jemez Mountains? Once we were back on the road we enjoyed some views of the mountains in the distance – maybe the Jemez Mountains? And we stopped for what became known on this trip as a C&C. Now, normally I don’t post about all the lame, boring meals we get in various places – you know – the quick road food. But my mom has apparently been getting the idea that we always eat these amazing meals everyplace we go. Except for breakfast – she knows we typically have the free breakfast at the hotel. So anyway, back to the C&C. We go hiking in the National Parks, and we make a lunch of easy travel food – bananas, nuts, granola bars, etc. We always try to have some protein, because hiking can be strenuous and you certainly don’t want to collapse due to lack of calories when you are halfway up a mountain. But for some reason, nuts don’t keep me full. We had the same meal at Chaco Culture, huddled in the car to protect ourselves from the wind, because it was too cold to get out and eat at one of the picnic tables. But, like other days, by about 3 pm, I was starving! And when I am starving, I get cranky. And I don’t mean that I get a little bit snarky here and there. I mean, people could DIE… Jon’s a pretty smart guy, so he has learned (it did take him a couple of near misses on his life) that it is in his best interest to feed me. The C&C was born. We head to the nearest McDonald’s so I can get a kid’s size cheeseburger to hold me over until dinner. And Jon gets a C&C. Coffee and a cone (as in vanilla ice cream cone). So there, now you know. Travel with us isn’t all about the glamour… Ha! How about you? Do you have any travel habits that you will admit to? So imagine my delight this evening when I got home from work to find momma hanging out looking for dinner with not three, but all four babies! All Four! 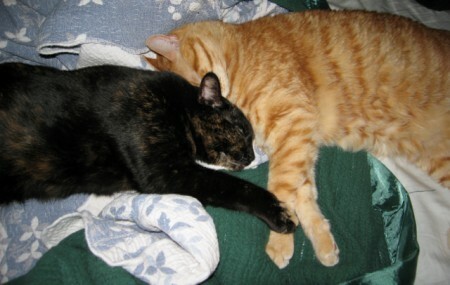 Aren’t they the cutest with their glowing eyes! 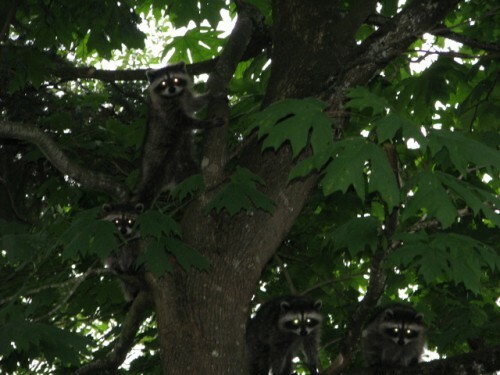 Sorry the pics are a little blurry – we are back to Pacific Northwest gray… Makes for dark photos… But as for the raccoons – Yay! Life is good. After Chetro Ketl, I made my way back to the car to warm-up a little, and Jon and I drove over to Casa Rinconada. Casa Rinconada is a village site at Chaco Culture National Historical Park, in contrast to the Great Houses that were constructed during the same time period. It was a village where daily living would have taken place, and is a much more simple style of construction, one story, and without the formal open plaza that the Great Houses have. Case Rinconada was excavated between 1936 and 1947, and after the excavation, many sites were covered over again to protect them from the elements and looters. Walking around the trail, we were struck by the fact that everyplace you look there are mounds of earth that cover Chacoan construction. 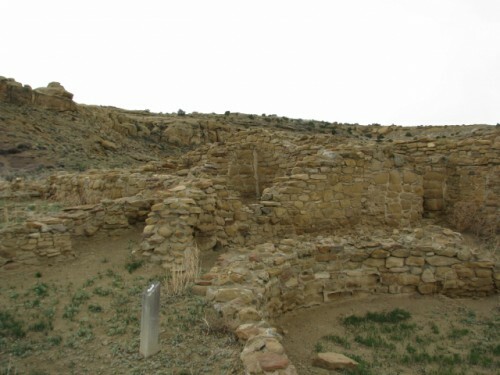 During the height of its existence, this was the “downtown core” of Chaco Canyon. Casa Rinconada’s homes are often built over other construction as well, including earlier pit houses. The Puebloans seemed to love to remodel and reuse. Some rooms were used for living, while others were primarily storage rooms that contained excess foods or materials. Casa Rinconada contains one of the largest kivas in the Puebloan world. It has T-shaped doorways that would have allowed for entrance into the kiva, instead of the only entryway being through the hole in the roof. The kiva also contains several built-in notches in the walls; they don’t know why but suspect that some of them are astronomical markers. The village also contains a keyhole shaped kiva, which is unusual. The excavations at Casa Rinconada revealed about 130 burials; these people were buried simply on twilled mats and without many grave artifacts. Some had clay vessels, potsherds and shell bracelets, but they were not as elaborate as the burials at Pueblo Bonito, where burials were accompanied by large quantities of worked shell, turquoise pendants and musical instruments. This gives researchers some insights into the social structure of the people who lived in Chaco Canyon. There is so much about this culture that we will never know, but it was fascinating to spend some time wandering around the sites and artifacts that they left behind and trying to get a glimpse into what life was like here. I hope I will get an opportunity to return, perhaps when the weather is a little warmer and I can hike to some of the outlying sites. And if you get a chance to visit, I hope you will take it! And with that, we got back on the long bumpy road and slowly made our way to the highway. Next stop – Santa Fe! In my last post, I described our visit to the Hungo Pavi and Pueblo Bonito sites at Chaco Culture, as well as the tiny cemetery where Richard Wetherill is buried. But we still had a few that we wanted to visit. 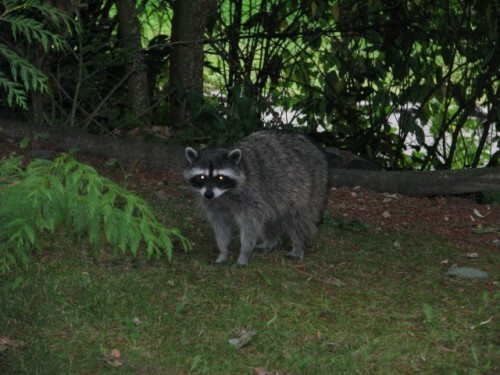 Or maybe I should say – that I wanted to visit. Jon had pooped out and decided to avoid the wind chill by spending some time reading on his Kindle in the car. Pueblo Bonito and Chetro Ketl share the same parking lot, but have separate trails out to each site. But, there is a trail connecting them that runs along the bottom of the cliff, and provides wonderful views of the petroglyphs on the cliff face. Petroglyphs are pictures that have been carved into the rock; usually by chipping away the outer, darker surface of the stone with stone tools. They are found all over the Southwest, and give insight into the things that the culture found important. 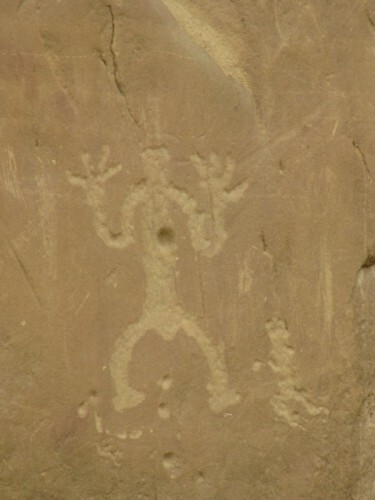 The Park Service has several stops marked on the trail, and you can stop at each stop and read about the petroglyphs located there in the trail guide that is sold at the Visitor’s Center, or at the parking area for $1.00. You can also borrow and return a guide if you don’t want to buy it, but for only $1.00, I took mine home with me so I could match up my photographs with what I was seeing later on. The petroglyphs here depict lots of geometric shapes, swirls, animals and human figures, although there is speculation that some of the human figures are supernatural beings (I’ll let you decide for yourself). 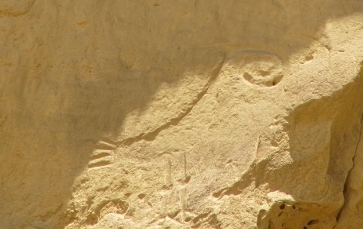 There is also graffiti that was left after Chaco Canyon was “re-discovered” in the 1800s and some contemporary graffiti. I find it sad that some people don’t have respect for these beautiful, historic sites, because once they have been defaced and damaged, they are gone forever. The trail is also a great place to view evidence of the blocks of rooms that were once built against the cliff. They have collapsed now, but beam seats, where the poles that supported the ceilings were once placed, are still visible. 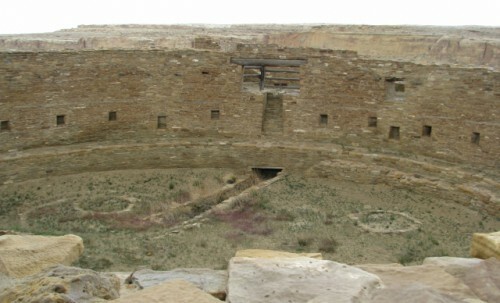 There is also evidence of a staircase carved into the rock, with handholds to help the Puebloan people climb the staircase and travel to other Chaco Canyon sites built on the top of the cliff. At the end of the Petroglyph Trail, I reached Chetro Ketl, and explored it in absolute solitude. Due to the challenges of the road leading into the park, and the fact that it was so cold that day, I was all alone at the site. Chetro Ketl is another Great House; it began as a single room block around 1010 A.D. but eventually grew over the next 100 years to be almost three acres in size. It was three stories tall, and at its height contained about 225 first floor rooms, and another 275 second and third floor rooms. Chetro Ketl shows signs of intentional burning. Archaeologists don’t know why, but some guesses are to prevent others from using the site after it was abandoned, or to represent a ceremonial closing of the structure. This Great House is also unique because the builders intentionally elevated the open plaza above the surrounding landscape, by hauling tons of dirt and rock to create a platform. Reasons for this are also unknown, but it is believed that the builders may be been trying to mitigate the effects of flooding in the area that occurs after heavy rains. 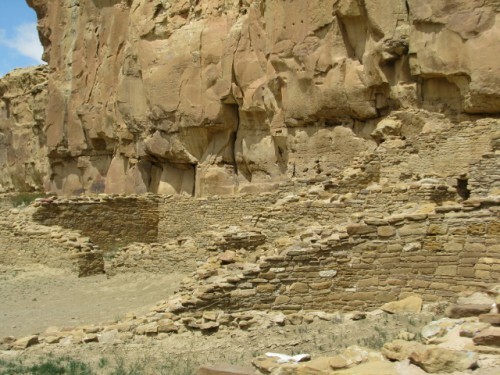 Chetro Ketl also once had balconies, similar to the ones seen at Balcony House at Mesa Verde. 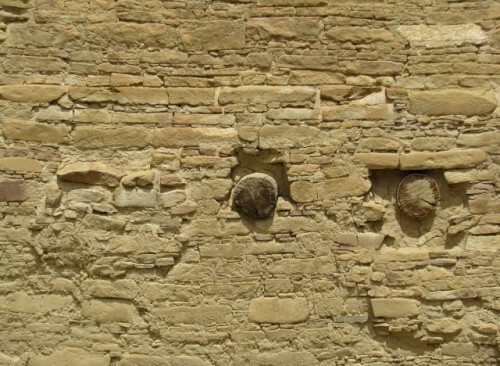 When Chaco Canyon was re-discovered in the 1800s, these balconies were still there, and were documented to be intact in 1901. Sadly, over the next 20 years, scavengers looking for firewood and building materials destroyed the balconies. The original wooden support beams – called vigas – wood doesn’t last 1,000 years where I live! There is also evidence of building with columns. 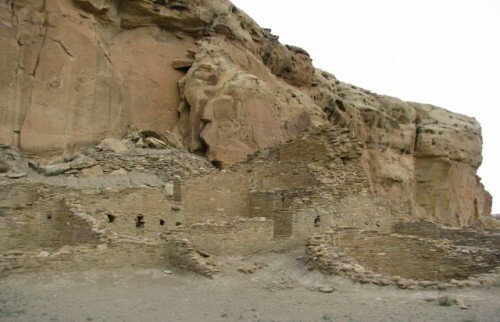 This style of architecture was not seen at other Puebloan sites, and archaeologists believe that the Chacoans borrowed this style from Toltec builders in Mexico. The Chacoans traded turquoise and macaws with the Toltecs, so it makes sense that the influence would go beyond just trade goods. Later construction at Chetro Ketl filled in the spaces between the columns, so now they are solid walls. Much of Chetro Ketl was covered back over with sand after it was excavated, in order to protect the site from further decay, so it is a bit tougher to imagine what it was once like than Pueblo Bonito. But it has so many unique features, that it is a fascinating structure to see. I loved my time there. I’ll tell you about the village site we visited next!